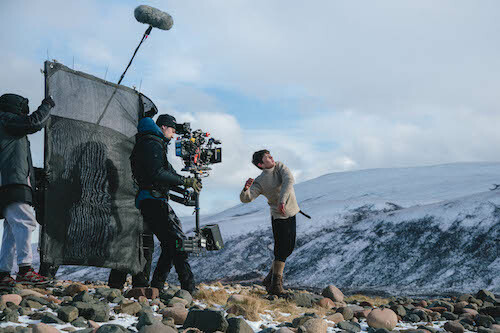 The film In the Fall was shot in Hoy by a Glasgow-based independent production company. Pictured is some of the crew, filming actor Lewis McGowan. A film, which was being shot near Rackwick Bay, in Hoy, by a small, Glasgow-based production company recently wrapped filming on the island, with help from a few locals and Scottish Sea Farms. The film, In the Fall, which is set in the 19th century, is an adaptation of a classic short story by acclaimed Candian writer Alistair Macleod. It is being made by Scots-Canadian duo Tom Gentle and Rupert Clague, who feared they might never wrap, after running into funding setbacks. Originally, the team had intended to film the story along Scotland’s west coast, successfully crowdfunding the £15,000 required to do so. However, when researching locations, they said they learned of Orkney’s iconic Rackwick Bothy on Hoy and immediately knew they couldn’t shoot anywhere else. To do so would require them to raise a further £5,000 –— a figure which later increased to £8,000 when one of their original sponsors had to pull out at the eleventh hour due to unforeseen circumstances. 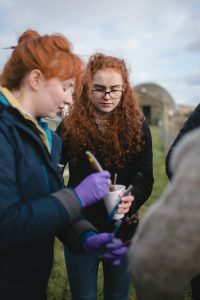 The film was completed with some extra help from Scottish Sea Farms and people from Orkney, such as Eilidh Fisher (pictured, right). Indeed, Tom and Rupert plan to enter In the Fall into major international festivals including Toronto, Sundance, Berlin and Venice, along with the UK’s top film festivals including Edinburgh, Glasgow, Inverness, Leeds and London. Amongst those rooting for the film to do well will be Orkney locals Eilidh Fisher and Rachael Batty. After reading about the production in The Orcadian, they applied to work on the production, securing roles within the costume and art departments for a behind-the-scenes insight into some of the roles that exist in the film sector. Gentle Giant Productions planning on returning to Orkney to talk to schools and community groups about the filming process.